Looking for an inexpensive and easy way to grow hydroponically? The PowerGrow Systems Deep Water Culture System is the answer! Super easy to use, the DWC system allows you to get up and growing in no time, with very little effort. The PowerGrow Deep Water Culture System includes everything you need for a complete system. In a Deep Water Culture system, the plant roots are immersed in an oxygen infused and nutrient rich water reservoir (a 5 gallon FDA approved bucket). The oxygen rich solution helps build healthy root systems faster and more efficiently than soil which results in superior plant growth and production. 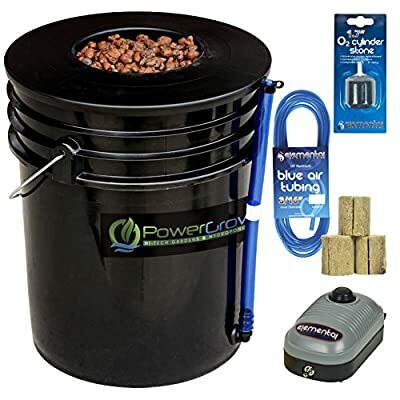 The PowerGrow Deep Water Culture System includes the following: 5 Gallon FDA Approved Bucket, 6" Net Pot Bucket Lid, Growing Medium, 44 gph Air Pump, Air Tubing, Air Stone, 3 Grodan Rockwool Starter Plugs, Blue Water Level Indicator + Drain, Complete Instructions, 1 Year Warranty. (Nutrients and pH test Kit not included) With the PowerGrow brand, you also get the quality assurance of a 1 year Manufacturers USA warranty. So what are you waiting for? 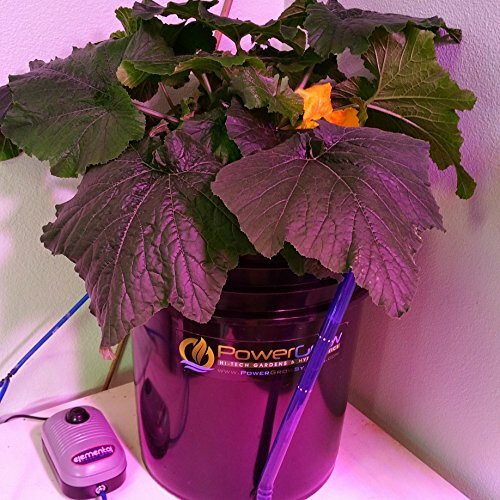 Get growing with a PowerGrow DWC Deep Water Culture System today! Easy to use inexpensive complete kit - Deep Water Culture Hydroponic System by PowerGrow® Systems Includes 5 Gallon FDA Approved Bucket + 6 inch Basket Lid Also includes 44 GPH Air Pump, Air Tubing, Air Stone, Growing Medium, and Rockwool Seeds Starting Plugs Features visible blue Water Level Indicator and Bucket Drain 1 Year USA Manufacturers Warranty on all Deep Water Culture Systems!